…I’d like seconds please. Award number two. When it rains it pours, in a good way. I’ve received a second award, the Versatile Blogger, kindly bestowed on my by Jeff Whelan. Go check out his site. Tell me about yourself, an award. Tell the world 7 things about yourself that you have not shared, yet. I’m a dyslexic writer. Is it a p? A q? Who the hell knows? If given the choice of taking a half hour flight or a three-hour drive, I’d choose the drive. No, I’m not afraid of flying, just enjoy driving. It’s all about the journey after all. As a child I owned a pet rat. I’ve taken wilderness survival classes. Bugs and bark? They’re not just for dinner. …but I”m also a roller coaster junkie. Go figure. I keep my nails painted not because it’s fashionable, but because otherwise I’d have no nails. I’m a thinking chewer, polish does not taste good. Okay, I’ve been pretty busy lately and need to apologize. 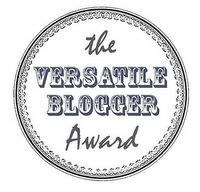 Two of my favorite bloggers have nominated me for a Versatile Blogger Award, Dennis Langley and M. J. Wright and it’s taken me some time to thank them and pass it on. Thanks to both of you. It’s always great to know that someone is reading your stuff and doesn’t think it’s total drivel. So now, according to the rules of the award, I’m to tell you some previously unknown info about myself. I’ve sold cars. Yes, I know, some were even used cars. The worst part about it? I had fun. I don’t really like chocolate, gasp. My favorite ice cream flavor is Black Licorice. I really hate what it does to your mouth though. Black tongue? Not appealing. I’m addicted to BBC America. If I didn’t live in the US, I’d probably just be addicted to BBC. If given the choice between a quick flight and a long drive, I’d choose the drive. I love road trips. I’m a political junky. I love debates, watching them not having them, usually. But don’t worry, they are a secret passion, not to be aired on this blog. Can I hear an Amen? I’m addicted to caffeine. I know, probably not much of a surprise. The best part of this award? I get to pass it on. Here they are in no particular order.